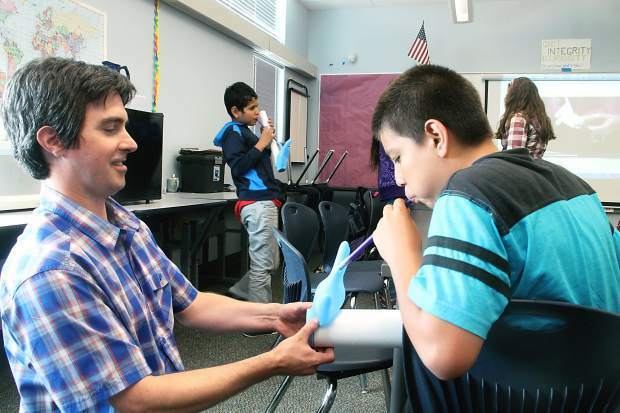 Bryan Duff, lecturer, Horticulture Section, School of Integrative Plant Science, and a pair of promising teachers in training are teaching film production and the physics of music at Colorado middle school. In film, students dress up, apply makeup and produce a piece of their own. When they’re done, they’ll be reviewed by a panel of college film students and awards assigned to the best one. Under the surface, it’s a lesson in storytelling and, by extension, writing. In physics, students look at how instruments are designed to shape sound waves. Looking at a diagram, they can tell you whether a trumpet will make a higher sound with a valve open or shut. To illustrate the point, they make instruments of their own, including bagpipe like glove-o-phones which bring to mind the vuvuzela craze of 2010.